Sacred Heart Catholic School has as its primary goal the continuous formation of the Christian person. Every day at Sacred Heart Catholic School begins with a school-wide prayer. 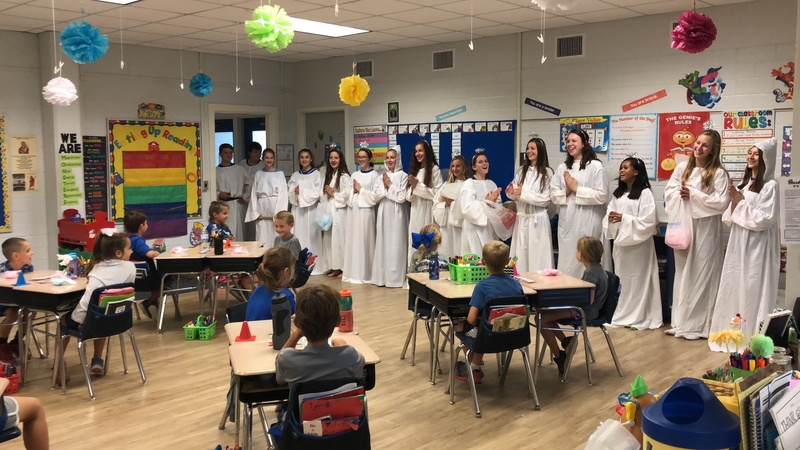 Beginning in the elementary classes, students are involved in the weekly school masses, Holy Days of Obligation, and other religious ceremonies. During the month of October, students pray portions of the rosary in each class. There is a Faith Formation column in the monthly school newsletter. This Is Our Faith Early Childhood Program is used for PreK-3 and PreK–4. Blest Are We religion textbooks are used for grades K-8 as well as the Benziger Family Life Series Guidance Program, which focuses on personal growth and self-understanding, Catholic Christian sexuality, and social living. Students in grades 5 through 12 attend retreats presented by the National Evangelization Team (NET) - a group of young adult Catholics who travel around the country sharing their faith. The program used for 8th through 12th theology classes is Theology of the Body for Teens – Discovering God’s Plan For Love and Life. Theology I includes an overview of Catholic Theology including Jewish roots, beginnings of Church, Scripture and Tradition, liturgy and sacraments, and Christian living. In Theology II students will explore the New Testament with emphasis on the life of Jesus as well as a study of the theology of Church and the history of the Catholic Church. The sacraments of Jesus as celebrated by Catholic Christians are the focus of Theology III. In conjunction with the study of sacraments, students will prepare for the Sacrament of Confirmation. Social Justice and Christian lifestyles are the focus of Theology IV. The students are challenged to begin to find their place in this world and integrate their faith with real-life choices.